https://sep.yimg.com/ay/yhst-33477391359232/dragon-wrasse-novaculichthys-taeniourus-rockmover-wrasse-6.jpgDragon Wrasse - Novaculichthys taeniourus - Rockmover Wrasse Expert Only!!! Not Cover Under Arrive GuaranteedAggressive75 Gallon11.8 inchesNoCarnivoreIndo-PacificLabridaeSmall 1." - 1.5"
The Dragon Wrasse is also referred to as the Rockmover Wrasse, Masked wrasse, Indian Wrasse, Olive-scribbled wrasse, Obi-tensumodoki ( in Japan.). 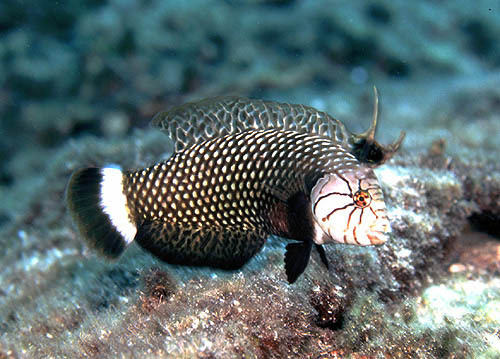 The juvenile of Dragon Wrasse has a burgundy body with white markings. The fins are also notable in their appearance, especially the first two dorsal spines that form a "cow-lick." The adult Dragon Wrasse normally does not have the large dorsal spines and has a light blue to green body with impressive darker markings. Dragon Wrasse is a salt water species found in regions of Indian Ocean, Pacific Ocean, Red Sea ,Panama, north to Ryukyu and Hawaiian islands, south to Lord Howe and Tuamotu islands; throughout Micronesia. Eastern Pacific: Gulf of California to Panama The Novaculichthys taeniourus or Dragon Wrasse begins life as a very cute and perky juvenile that is great for a community tank. As it grows it will become a hardy eating machine that will starve if underfed. Dragon Wrasse is more often killed by aquarists than dying from other influences such as bad tank parameters. Dragon Wrasse will redecorate your aquascaping as it ages. Care level for Dragon Wrasse is between moderate and high. It should reside in a 150 gallon or larger aquarium with a 2-4 inch sandy bottom in which it can submerge itself. Dragon Wrasse sleeps in the sand. Dragon Wrasse is not reef compatible. It may be kept with fish that are aggressive or larger than it is, but house only one per tank. Dragon Wrasse should not be placed in a reef aquarium. Dragon Wrasse enjoys eating crustaceans, snails, shrimp, starfish, smaller fish, worms, and other invertebrates. It also moves the corals and rearranges the rocks in the aquarium to find food. The aquarium should also have a tight-fitting lid to prevent it from jumping out. Dragon Wrasse or Indian Wrasse is a very hardy fish that is more often killed by aquarists than dies from other reasons In the wild Dragon Wrasse feeds itself by turning over rocks and eating things like the mussels, urchins, and starfish that it finds under the rocks. The diet in aquarium should include meaty items such as chopped sea foods, brine or mysid shrimp, live black worms, grass shrimp, and flaked food. Larger specimens of Dragon Wrasse may be given small feeder fish. Maximum Size: Dragon Wrasse grows up to 12 inches. Minimum Tank Size: The Dragon Wrasse prefers a tank of at least 150 gallons with plenty of places to hide & swim. Water Conditions: Keep water quality high (SG 1.020 - 1.025, pH 8.1 - 8.4, Temp. 72 - 78� F). Tank set up may be gravel or sand with 2-4 inches of fine substrate to sleep in night. Feeding and Diet: Dragon Wrasse is a carnivore and likes to eat variety of meaty treats including frozen mysis, saltwater feeder shrimp, squid, scallop clam and other crustaceans. Will eat any marine flesh - non-oily. It is a gluttonous feeder that quickly starves if underfed.